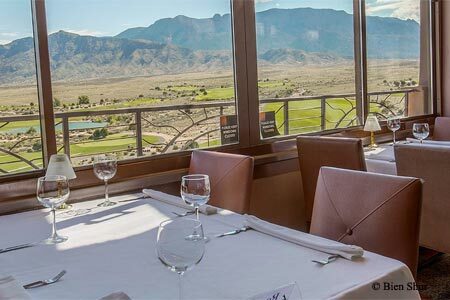 Fine dining for high rollers at the Sandia Resort & Casino, complete with jackpot views. : Whether you’ve just gotten engaged or made a killing at blackjack, Bien Shur is a sure bet for celebrating. Boasting spectacular views of the mountains for which the Sandia Resort & Casino is named, the elegant, Southwestern-accented dining room on the ninth floor features steakhouse fare that’s typically long on luxury but admirably short on clichés (although the wine list doesn’t forego tradition, with its Champagnes, cult Chardonnays and big reds). Lobster bisque, for instance, gains oomph from the addition of pumpkin and Pernod cream. Old-school shrimp cocktail becomes a refresher course in Southwestern flair, doused in tequila and served with red-corn tortilla chips and guacamole. Meyer-lemon butter brightens smoky chile-and-piñon-crusted salmon, while the usual bone-in rib-eyes and strip steaks are rounded out by sous-vide elk tenderloin, and bacon-wrapped buffalo loin (try it with red-chile demi-glace). And desserts like gingerbread crème brûlée with roasted marshmallows are unexpectedly playful. Though the kitchen does have its off-nights, they’re rare --- as well they should be, given the prices. Still, if you’d rather save even the slightest gamble for the slot machines downstairs, hit the rooftop patio for cocktails instead --- the panorama’s the same, and the risk is nil.